The best known name for stonemasonry in this area is Pullin. The business, situated in High Street next to the railway bridge, still bears the Pullin name even though there is no longer a family connection. George Pullin started the business in 1875 in King’s Heath near Birmingham and his son, Charles inherited it. Charles moved to Leamington Spa in 1910 for health reasons and his first premises were in Bath Street, (now Ace Caterland). He was a widower and moved into Beaconsfield Street with his young son and daughter. The family attended St Mary’s Church and it was there that Charles met Mabel Smith, a Sunday School teacher. They married at St Mary’s in 1916 and four years later Raymond was born. After leaving Central School in Leicester Street (now Campion School, Sydenham) Ray was apprenticed to Cundall, the architect, after which his father insisted that he join the family business. He was unhappy with the dirty, dusty work but this was curtailed by the outbreak of World War Two. Ray joined the Royal Navy and was based in Scapa Flow and the Mediterranean where he was involved in many operations. He gained promotion, becoming First Lieutenant in 1943. After the war his last commission was at Saltash, near Plymouth where he was commanding 45 men who were working on maintaining old naval ships. On his return to Leamington Ray at first thought of applying for jobs but decided to return to the family business which pleased his father enormously. He never regretted it and his workmanship can be seen far and wide and did not only involve gravestones. 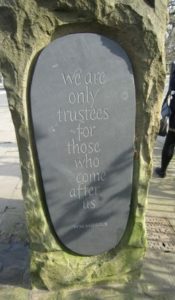 Examples in Leamington, to name but a few, can be found on the Spa Water Fountain, the Jephson Garden gates on Newbold Terrace, the Midland Oak Memorial, the War Memorial and the Town Hall plaque which was unveiled by the Queen. Ray also had commissions in London, Yorkshire, Kent, Cambridgeshire and Hampshire. The business prospered and between1949 and 1961 Pullins took over the other stonemasonry companies in Leamington – Rathbones, Aldridges and Checketts. Ray sold the business in 1978 but continued to work as a Consultant. 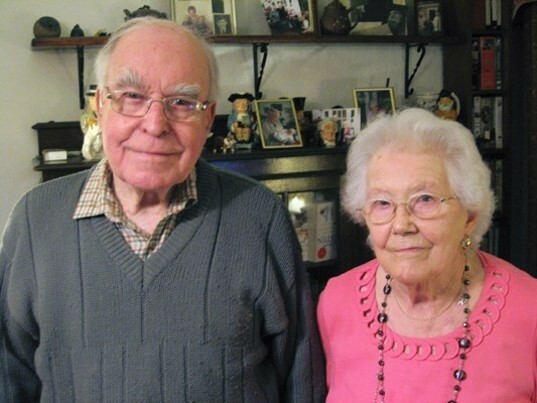 In 1947 Ray married Eileen Wilson whom he first knew at school. They lived in Leamington until moving to a cottage in Offchurch in 1971. They had one son who now lives in Paddock Wood in Kent and now have grandchildren and great-grandchildren. During their time in Leamington the family were very involved in St Mary’s Church but on their move Ray became a Reader at St Gregory’s, Offchurch. Ray’s activities outside work are too numerous to mention but he served the interests of Leamington on many committees, often as Chair, giving his time freely. He was the youngest magistrate in Leamington in 1953 and one of the first ones to be appointed by the new Queen. He enjoyed football and cricket and was a keen West Brom supporter. In recent years as Ray and Eileen’s health started to fail they moved to Kent, near their son but the Pullin name will always be remembered in Leamington with the many gravestones, monuments, plaques, plinths and other memorials that were so lovingly and skilfully created. This article is based on a talk I gave about six years ago to Sydenham History Group. It was compiled with his assistance, from Ray’s memoirs.